Tilapia is more commonly known as the type of fish served in restaurant rather than the one kept in aquariums as pet. However, that doesn’t mean that fish tank hobbyist do not fancy having the fish around as there are some who would rather keep them in large viewing tanks rather than putting them in ponds. They are also easy to keep without needing much attention which is why they are popular among beginners to freshwater fish since some common mistakes are unlikely to harm them. Tilapia forms a large group of fish family comprising 3 main genera which are Sarotherodon, Tilapia and Oreochromis. All the fish that belongs here are collectively identified as having the same characteristics and appearances which are native to the rivers in Africa. They are basically a type of cichlids and among the most popular species in this group are Blue tilapia, Red tilapia and Wami tilapia. Tilapia fish is also identified using different names such as Snapper and Mojarra but basically it all points back and refer to the same type of fish. 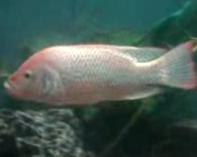 Keeping a tilapia in aquariums is very much different from having them in ponds. 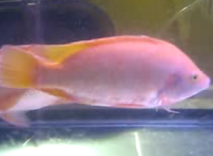 Although the fish can tolerate wide range of water quality (those usually not suitable for common freshwater fish), the water for tilapia kept in aquariums has to be always clean leaving minimum debris floating around or else it will defeat the purpose since the hobbyist need to have a clear view of it in the display tank. They are heavy eaters meaning that if you feed them regularly, soon enough you will find that they can grow up to very large size in a matter of months. Based on my own experience, the tilapia fish that I had was only about 2 inches in length but grew to over a foot in just 8 months. During that time, the fish consumed a lot of food ranging from live worms, insects and even vegetable waste and it was quite a challenge trying to keep the water clean just for viewing pleasure. The water condition to house your pet fish should have the temperature somewhere from 20 to 30 degree Celsius although anything out of that range which is too cold or too hot is not recommended. They are not the type of community fish suitable to be kept with other smaller fish because they will gobble up the food leaving nothing for the rest of the tank mates. So far, the best companion that I’ve found for them are corydoras catfish which complements well with their behavior of sometimes leaving uneaten food around. All in all, if you are an avid hobbyist who likes the pleasure of having an active companion around and look upon challenges to maintain perfect living condition, then I would suggest keeping tilapia as a pet.